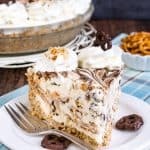 This Salted Caramel Brownie Brittle Ice Cream Cake has layers of ice cream and a crunchy crust making it perfect for enjoying on a hot summer day. 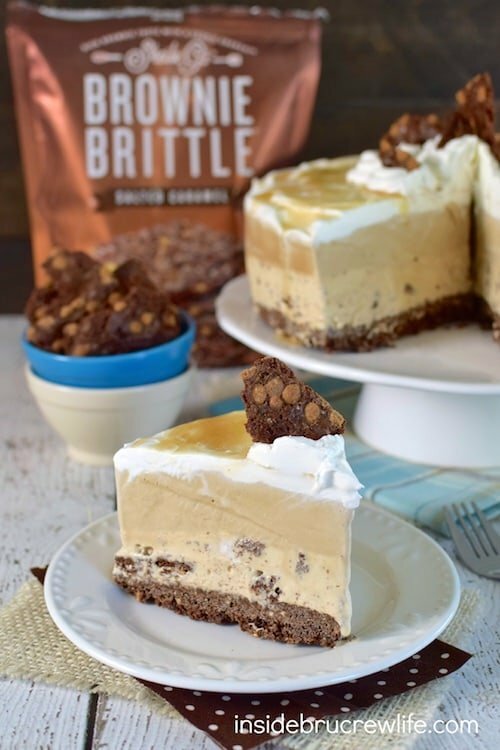 *I am partnering with Brownie Brittle™ to bring you a delicious dessert recipe using the sweet brittle crunch. Summer is officially here. The hot weather definitely found us this week. We went from 70 degrees to 90 degrees in the blink of an eye. Oh, I’m not complaining. I do enjoy a good hot day…as long as the air conditioner works and there is ice cream in the freezer. Most of the time the ice cream in the freezer is fair game. Well, until I have a crazy treat idea running around in my head that involves ice cream. Then I try to hide the boxes of ice cream behind the green beans and broccoli. Most of the time that works. I mean who is going to look behind veggies for ice cream, right? Says the lady who has cookies and candy hidden in every cabinet of our kitchen. I think my family might be on to my little “hiding all the sweets” game. The last time I had a box of ice cream that was “hiding” in the freezer they kept asking me about it every day until I gave in. But this time I was smarter. You see I bought the ice cream I needed for this cake, AND I bought an extra ice cream container. Then I put all the ice cream in the freezer in plain sight. The last thing I did was make sure I told each and every person in the family that two of these three were off limits, but that they could eat all of the third box. No one kept hounding me about the extra ice cream because they knew it had a purpose. Of course it might have helped that I made this ice cream cake the very next day. I don’t trust the ice cream monsters that live with me! For this ice cream cake, I made a Brownie Brittle™ crust. Have you tried this awesome snack yet? Seriously it is so good. 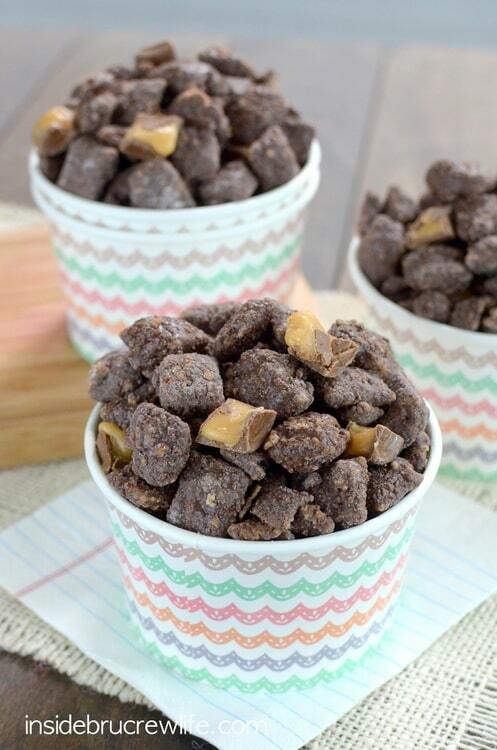 The crunchy, chocolate pieces are studded with so much flavor. My favorite is probably the salted caramel. But then again, sweet and salty is my jam! 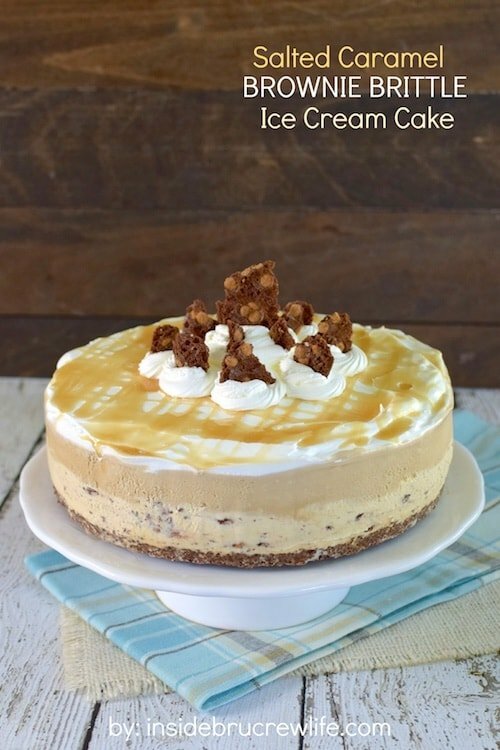 Ice cream cakes are so easy to do. There is no baking involved, but it does take a little bit of time because you have to freeze each layer one at a time. That is if you want a perfect visible line for each flavor of ice cream. If you don’t care about that line, feel free to layer away without waiting. Make your crust and place the pan in the refrigerator. 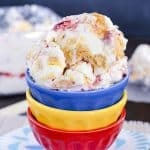 Remove the first box of ice cream from the freezer and place it on the counter for about 25 minutes. Use this time to dust or do dishes. Then stir it until it is creamy, but still frozen. Spoon it onto the crust and smooth it out. Put the pan in the freezer and remove the second box of ice cream. Repeat the process, only this time do laundry or clean the windows. Or catch up on your favorite show…it’s totally your call what to do during this time. When the time is up, stir the ice cream and spoon it onto the frozen layer. Add Cool Whip, caramel drizzles, and extra Brittle pieces for decoration, then back into the freezer it goes for a few hours. A deep freeze is recommended because they freeze things a little bit more solid than a freezer in the refrigerator. But don’t stress out if you do not have one. If that is all you have, just make sure to freeze your cake a little bit longer. That way it is completely hardened before cutting into it. The ice cream monsters were completely hovering around me as I tried to snap a few photos of this cake. Believe me, monsters and an air conditioner that isn’t quite working is not a good combo when you are trying to work with ice cream. I should take pictures of ice cream more often…I think this was one of the fastest photo shoots I have done yet. 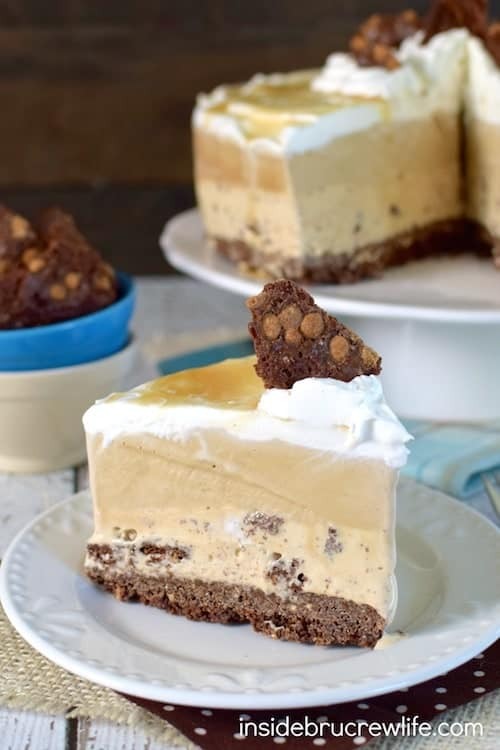 Layers of ice cream on top of a Brownie Brittle crust makes a fun and refreshing treat on a hot summer day. Crush 2 bags of Brownie Brittle into 2 cups fine crumbs. Mix with the melted butter. Press into a 9 inch springform pan that has been lined with wax paper. Refrigerate. Open the third bag of Brownie Brittle and break up enough pieces to measure 1 cup. Set aside. Remove the salted caramel ice cream from the freezer and set on the counter for 25 minutes. Spoon into a large bowl and stir until slightly creamy. Stir in the Brittle pieces. Spoon onto the top of the crust. Smooth out. Place in the freezer. Remove the coffee ice cream and set on the counter for 25 minutes. Stir until creamy. Spoon onto the top of the ice cream in the pan and smooth out. Return to the freezer for a few hours. Run a hot knife around the edge of the pan to loosen the ice cream. Remove the sides of the pan and take off the wax paper. Place on a serving plate. Spread half of the Cool Whip on top. Drizzle with caramel topping. Swirl on more Cool Whip in the center and top with extra Brownie Brittle pieces. Keep in the freezer until ready to serve. Serves 12. *Freezing in a deep freeze is recommended, but not necessary. The deep freeze will freeze it harder than the freezer in your refrigerator. If you do not have a deep freeze, let it freeze overnight for better results. *This post and recipe has been sponsored by Brownie Brittle™. As always, all opinions expressed in this post are 100% my own. 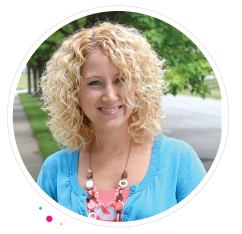 Thank you for letting me share products and brands that we use and love. Oh I HAVE to try this! Farmer’s birthday is coming up and he is in love with ice cream cakes. Thanks Jocelyn! First of all, wow. I would not be able to stop myself from snatching a slice during your photo shoot! Even though during a photo shoot of my own the other day, this little pudgy three year-old hand kept sneaking onto the table to grab chocolate chips and into my frame. You are right…they are on to that veggie trick! I’ll have to try the more ice cream trick more often! This looks awesome. two of my favorite flavors of ice cream in there too 🙂 Speaking of ice cream monsters. I bought two cartons of vanilla intending to use for a recipe. My monsters ate it. ALL. Hahaha! 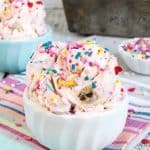 Sounds like we have the same kind of ice cream monsters in our houses! Oh man. I love hiding the good stuff somewhere in the kitchen from the hubs…which sadly means in plain site because he doesn’t look more than straight in front of him! ha. But this cake I would need to share or I would eat the whole darn thing! That’s so true…if I “hide” things in plain sight no one in my house will be able to find them either! Love it! 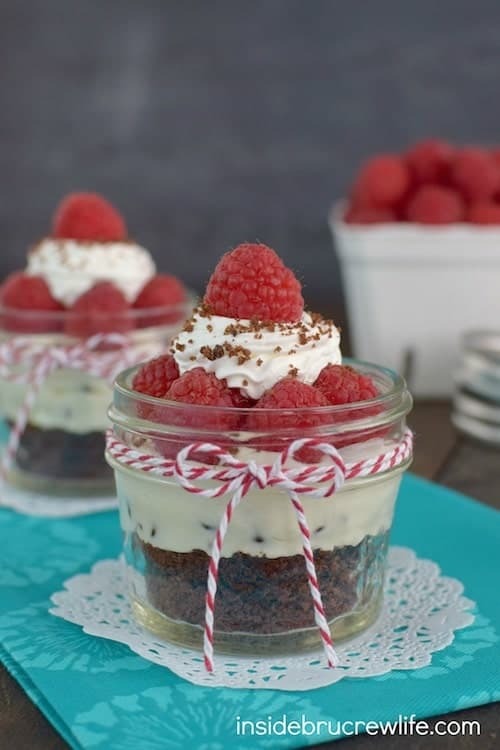 This is definitely a sharing kind of dessert…I keep slicing off a little sliver each day! This looks delicious! That slice looks honestly magnificent 🙂 Pinning! Jocelyn – You never cease to amaze me with your creativity. I’ve seen brownie brittle in the stores, but have resisted the temptation of trying it. If I make an ice cream cake out of it, then I will be able to share! 🙂 Thank you for showing this beauty to all of us. Thank you so much Erin!!!! You are so sweet! Definitely snag a bag of brittle…it’s so good!!! This sounds delicious. I love caramel anything. I know, right? It’s seriously amazing stuff!!! 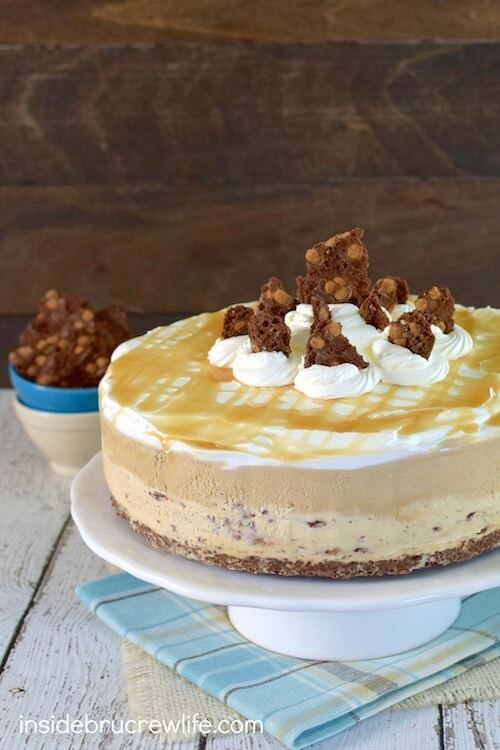 Summer is the perfect time to bust out the ice cream cakes! I can’t wait to see what you make! and yes, get a bag (or 2) the next time you are out! OMG girl – this cake- AMAZING. drooling all over my keyboard! 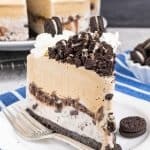 Yep, I officially have fallen in love with this ice cream cake! 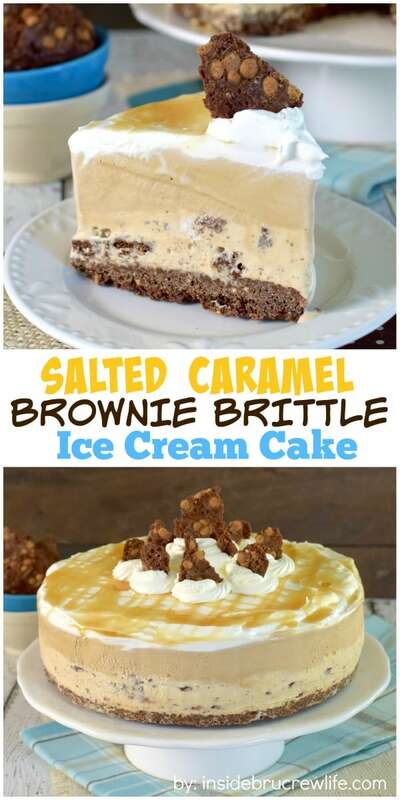 I love anything with brownie brittle in it, and the caramel plus ice cream is such a winning combo! 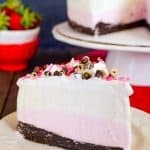 It’s easy to fall in love with ice cream cakes when it is super hot outside. And I’m with you on the brittle loving…I can’t stop snacking on it! This is awesome!! 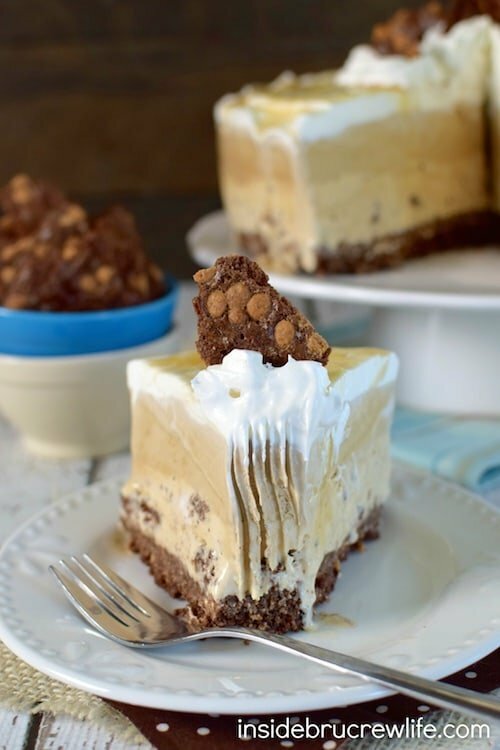 Every layer is perfect, but I have to say, the Brownie Brittle Crust is pretty perfect here! 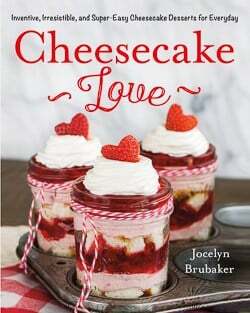 This cake is amazing, Jocelyn! 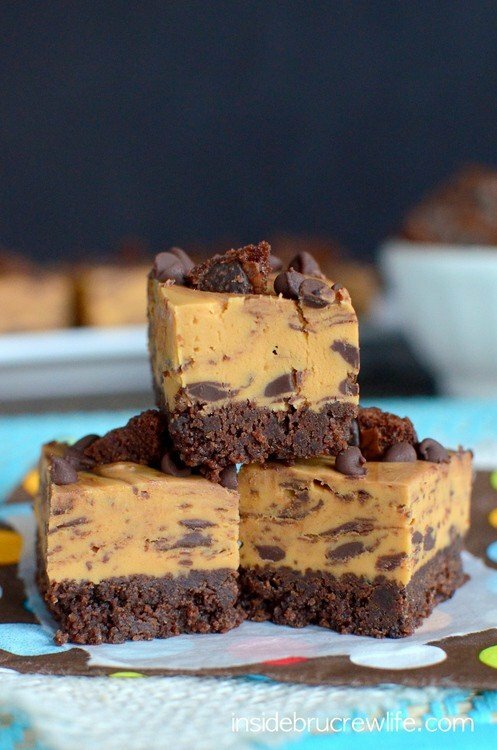 The brownie brittle crust is genius and I love the flavors of all the layers. They look perfect! 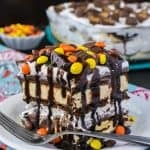 My mind has been on all things ice cream cake lately! Great choice! Salted caramel ice cream is my absolute favorite… I just discovered it not too long ago and now I can’t get enough. I love this cake – so much texture and flavor! Now this is my idea of the perfect ice cream cake! I’ve been looking online for days and clearly should have started with you. I was looking for one with brownie brittle! Pinned! Do you cover this while it’s in the freezer? Yes, I would cover it while it is in the freezer, so it doesn’t absorb any smells from anything else. I hope you enjoy it. If I’m not a coffee fan, what could I use to replace that flavor of ice cream? Looks delicious! !